This past May, mom and I along with my husband Jason’s Mom and his Aunt Julie went to an Annie Sloan painting class. We had so much fun that we decided to continue our little art nights, calling them Artsy Fartsy Fun Nights. Last night we got together at Jason’s mom and dad’s house. We were supposed to be there at 6:00, however when I was in the shower just after 5:00, Puppycat kept barking and barking. Because we live in the middle of nowhere, it’s not uncommon to have a deer in the yard so I just assumed that is what it was, however she kept barking and barking, so I figured I better check it out. I hopped out of the shower quick and looked out the window to see cattle out everywhere! I hopped back in to get the shampoo out of my hair and threw some clothes and shoes on and ran out the door. As it turns out, there were some coyotes that we think spooked the cattle in the north shed, causing them to break down on of the fences and jump up an embankment. Once we had them all back into another pen, I ran back in the house, finished showering and was off. I sure wasn’t going to miss Artsy Fartsy night! 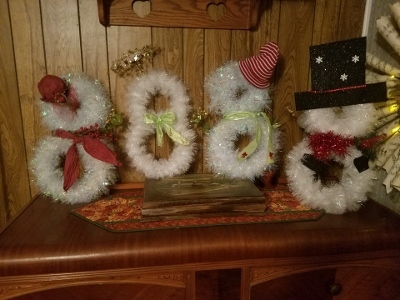 Our project for the night was snowment that we made with garland and wreath forms. We then decorated them with some odds and ends things that Renee had. Mine is on the left–I tried making it a little fascinator hat! 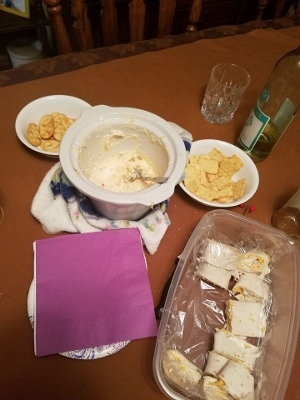 We also had some wonderful crab dip and chicken roll ups…and a bit of wine too! I always love artsy fartsy nights as it’s nice to get out and see people and do a little bit of crafting that I haven’t done before or might not do on my own, but it seems as though I burn myself with a glue gun every time–and this was no exception! This one was a bit of a doozy! I suppose I should work on my glue gun skills in my spare time! This entry was posted in Uncategorized on November 23, 2016 by Kelli. Probably too late now, but separate a raw egg and use the white (use yolk for something else or toss). 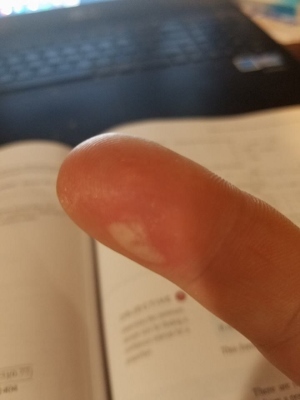 Fingers are easy – just soak your finger in the white as long as possible for the first 1-4 hours of the burn. You will be amazed at how fast it heals! I suggest a low temperature glue gun. I’m a big fan of the low temp glue gun too. Just curious. Why did you name your dog “puppy cat”? I have a cat who follows me everywhere and my husband calls her my puppy cat! I am more concerned about the cattle….. was a different pen the “answer”? And am super happy that you get out and do some fun things with friends. Here’s a little something for you next Artsy get-together. You can work on these Christmas Origami Wreaths for next Christmas. I had great fun making these, and the directions on the web page are illustrated – very easy. Enjoy!